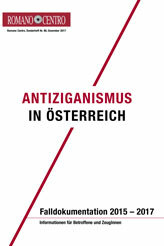 We are happy to announce that our member from Austria Romano Centro published the third report on Antigypsyism in Austria that covers the period from November 2015 to October 2017. L ike the other two publications from 2013 and 2015, this report also follows a twofold objective: 1. Awareness of the wide public on the issue of antigypsyism. 2. Empower the people who are affected by antigypsyism to report the incidents and to defend themselves. The report in hand is not a scientific study. Instead, it is a depiction of individual incidents that were reported to the Romano Centro and other counselling centres. The reports include statements about the frequency of antigypsyist incidents and cover different areas where most of these types of incidents take place. The report incorporates Reference Paper on Antigypsyism published in 2016 by the The Alliance against Antigypsyism that describes key features and manifestations of the phenomenon.